The term 'suspension' refers to all the components attached to a vehicle's wheels which support the vehicle. Its main purpose is to absorb the impact of uneven road surfaces and help the car maintain itsbalance when turning. The suspension system lies in between the car's tires andchassis. Its major components include the wheels and tires, springs, shock absorbers and struts, linkages, bushings, bearings, joints and steering systems. Air Suspension: This technology is commonly found inhigh-end, luxury models. It is preferred for its ability to provide an ultimateride experience by capturing vibration and shock taken up by the tires. Some manufacturers market their air suspensionas being similar to riding on a magic carpet. Spring Suspension: More commonly found in cars today, springsuspension uses flexible metal buffer to dissipate vibration energy from thevehicle tires. 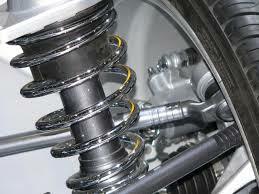 Adaptable Suspension: Modern cars come with adaptablesuspension. Known as driving modes, this feature allows drivers to customizetheir vehicles suspension response to suit their driving style and conditions. Mostcars come with at least three options: normal, comfy and sport. The normal mode is designed for everyday drivingconditions. Comfy biases the suspension to provide the most comfortable ridewith maximum absorption of bumps and potholes. Sport mode unleashes the car'smaximum performance, tuning the suspension to a more aggressive, nimbleresponse. At the base of the suspension system is the tire. Tiremaintenance is important for the proper working of the suspension as the system’sability to provide a smooth ride is compromised if tire pressure is uneven.Consistently monitoring tire pressure ensures a safer ride and enables thesuspension to perform in top shape. Some tires may appear to be inflated butare actually lower than their recommended pressure. It is therefore importantto use a tire gauge to check the pressure and not visual feedback. Rotating the tires every 10,000 miles also helps preservethem for longer. This is because, after a while, the tires wear out accordingto their location on the chassis. This is checked by looking at the tire threaddepth. If too shallow, the tires will need to be replaced. Periodic wheelalignment is also recommended for a healthy suspension. It is recommended thatyou have your wheels aligned every two years or 30,000 miles. The steering system is also critical to the suspensionsystem. The steering does not need much maintenance beyond a top-up of powersteering fluid which can be checked at every oil change. Other suspensioncomponents such as bushings, bearings and joints experience ordinary wear andtear and should be checked while the car is being serviced, after every 15,000miles or so. West Coast Auto has an industry-leading team of mechanicsthat can make accurate suspension diagnoses as well as perform quick andcost-effective suspension services. Get in touch with us to learn more.